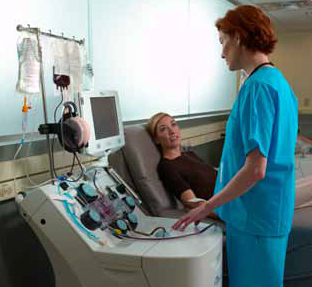 It is a fully automated modern continuous centrifugal flow apheresis device for the separation of whole blood and collection of its components. The blood components produced are ready for transfusion or storage. All the collected products are leukoreduced. The TerumobctTrimaAccel system is designed to give you the flexibility and advanced technology to safely collect more of the specific blood components your center needs, in the easiest, most efficient way possible. The TrimaAccel system will help you optimize procedures, improve inventory and increase productivity. The TrimaAccel system Safety Box, automatically lets you know which combinations of components donors can safely donate without dropping the donor’s platelet or red blood cell counts below minimum levels or collecting too much blood volume. • All other possible combinations depending on the Donor parameters.